THANK YOU TO CARLY FOR GETTING THIS CONVERSATION STARTED. How long have you been blogging for? Why did you start? What do you want from writing? I just started blogging in January of this year. 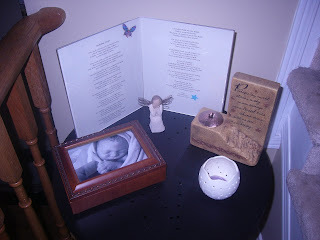 We lost our sweet baby boy, Nicholas at 35 weeks in November 2008 and in a desperate search for comfort, support, I came across many blogs of women who have experienced the same heartwrenching loss that I am experiencing. I suddenly didn't feel so alone. I have always had a passion for writing, capturing moments, etc. and so I decided that I would create my own special place in honour of Nicholas and our family. Where is safest place for you to share your feelings? Is there anywhere you feel completely accepted just being however you are really feeling? My husband has been the absolute biggest support for me. Although we are grieving in different ways, we respect each other and support each other. We are forever so intimately connected... he is the only one who travels on this journey with me, completely. Can you recommend any books that you have read that have given you a new insight, hope or courage in this new life you find yourself in? "Life Touches Life" by Lorraine Ash was recommended to me a couple of months ago and although I wasn't ready to read it then, I just finished it. This book is written by a mother of an angel. Her words are beautiful, honest and inspiring. It definitely has given me some hope that there is light.... it may be dim at times, but it's there. How would you describe yourself before you lost your baby. How have you changed, who are you today? I think, like so many, I was in the mindset that these things don't happen to us. I had two very healthy pregnancies and have two beautiful, strong boys. I had no idea that things could go so terribly wrong. I feel ashamed that I took such blessings for granted. I now have been forced to realize just how extremely precious life is... how incredibly lucky we are. I kiss my kids more, I tell them I love them more, I hold them closer than ever before. This experience had changed me profoundly.... I am still learning who I am now. WHat I know for sure is that I am so proud to be Evan, Kyle and Nicholas' mommy. How do you think you are coping? Do you see any light in this road or is it all dark right now? Where do you imagine yourself to be in a years time? Like Carly said... I feel like I am just coping right now. There are times, days when I am a disaster and others that I feel like "I can do this". I know I must continue with the "routine" for my boys. They deserve that and I refuse to become a sad, miserable mommy. They are here and they need me. I take comfort in the fact that Nicholas would want me to be strong. We went through so much during our pregnancy... we are forever connected. We will also be trying to have another baby... We have so much more love to give. For so long after we lost Nicholas I felt like I had disappointed so many people - heck, for the most part, I still do. I wasn't able to protect my precious baby. I wasn't able to control what was happening to my body and I couldn't control the horrible outcome of the whole situation. I was out of control, which undoubtedly, is one of the most helpless feelings in the world. I feel like I disappointed our parents for not "making good" on their grandson. I feel like I disappointed my husband because I couldn't keep our son safe. I feel like I disappointed my other two sons for not bringing their baby brother home to them. It is a whole different kind of heartache to watch your 5 year old feel so sad. To hold him while he cries for the brother he wanted so badly. To try to answer the unimaginable questions about death and beyond (I don't even understand it, why should he?). To reassure him that mommy will be okay. To let him know that it is okay to be sad, but that he shouldn't feel bad to be happy too. Evan (my 5 year old) asks about Nicholas often and includes him when he speaks about his family. I am grateful for that... it makes me feel like we're doing something right. Kyle (my 3 year old) only understands that the baby died. He worries about me. The other day was a very bad day for me and Kyle kept hugging me and asking me if daddy was going to "fix" me... out of the mouths of babes. Most of all I feel like I let my sweet baby Nicholas down. Why did I have to get so sick while carrying such precious cargo? I will never know the answer, I realize that, but the "disappointment factor" will never go away. A few months before Nicholas was to arrive my mom looked high and low for a frame to match our other two boys frames. 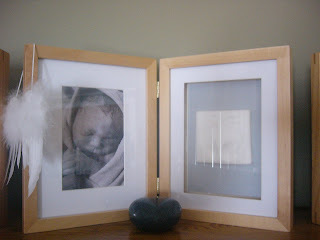 The frames are meant for a picture of your child on one side and on the other side, the foot/handprints molded in clay. She finally did find one... and only a few short months later I was devastated that I wasn't going to be able to use it. Then, one evening a couple of weeks after we lost our sweet angel, my beautiful husband brought out the frame. In it was two tiny footprints molded in clay... our Nicholas' footprints. My husband had asked the doctor to take the imprints for us and I had no idea. I was completely overwhelmed and filled with so much love for him at that moment. Now we have three matching frames for our three beautiful boys. I will never know where my husband got the strength to ask for this (or even think about asking for this), but I will forever be grateful that we are able to use our matching frame... and that our boys are together where they belong. I don’t remember much of that conversation. I had waited over an hour for the doctor and during that time I was calm and relaxed, actually enjoying the time to myself (albeit in a hospital waiting room). My OB had told me not to worry, in fact, he said “don’t lose any sleep over this. Ninety-nice percent of the time these concerns work themselves out and everything is fine, the baby will be fine, we are just being cautious”. You see, I had a difficult and complicated pregnancy. At 20 weeks I was rushed by ambulance to Ross Memorial Hospital in Lindsay (it was July and we were cottaging on Balsam Lake). The physical pain I felt that day was horrendous. I knew something was very wrong… I just continued to pray that it wasn’t the baby. Then the ambulance attendant said that we were going to go straight to labour and delivery. My heart sank, I continued to pray. It ended up that I had an eight centimeter cyst on my left ovary which had twisted, cut off blood supply to the ovary and was causing an enormous amount of pain. The doctor told my husband and I that if I didn’t have this emergency surgery that both the baby and I wouldn’t make it. So, I had surgery to remove both the cyst and my ovary with my precious baby on board. When I went to sleep from the anaestetic that night I didn’t know if I would wake up still pregnant or not. I was terrified that I was going to lose our baby and yet I had no choice, no control over what was happening to my body. When I came to I was so sick from all the meds that I didn’t even remember where I was. All I wanted was my husband and all I could think about was our baby – did he make it? He did. In fact, he seemed completely oblivious to all of the excitement and content to just hang out in mommy’s belly, safe and warm. Three days later I went home and started the process of recovering from major abdominal surgery. Every kick, every turn, even every hiccup seemed to resonate through my scars but they were all the most reassuring feeling in the world. My baby was alive and well... he seemed to be letting me know it. About 10 days later I knew I wasn't getting any better. The bouts of pain would come and go and I would double over in agony. I decided that I should go back into the hospital and figure out what was going on. More pain management, more rest.... The doctors figured that I had a blood leak of some sort because my blood count was very, very low. Again, the baby was fine... or so we thought. I seemed to recover slowly after that. I forced myself to rest and rest and rest. Every movement was painful, but well worth it. I was just happy that it was me experiencing the pain and not my sweet baby boy. We got that appointment at Mt. Sinai and took all of the tests. I still remember being in a waiting room full of happy, healthy pregnant woman and wanting to crawl into the walls. I couldn't believe what we were there to do, the news we were going to get... my husband and I just continued to pray and think positive. The news that Tuesday evening was more than devastating. They took us into a private office (which is never a good sign) and laid it on the line. "Part of the baby's brain has not formed at all... it seems that there was a significant loss of blood to the baby at some point and he is barely surviving". I was completely and totally numb. I remember the doctors and my husband talking to me, but I couldn't move, I couldn't speak, I couldn't even cry for a moment.... and then I screamed a scream that I have never heard before. I was shaken to the core and holding onto my belly for dear life. 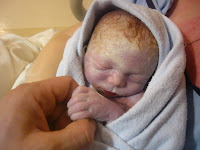 A week and a half later, at 35 weeks, I was induced into labour. Nicholas didn't want to come.... it seemed to take forever. Nurses and doctors were in and out, some with looks of such pity and sorrow and others with beautiful, reassuring words that I will stay with me forever. Finally, at 1:35pm Nicholas honoured us with his presence. He never opened his eyes, he never cried..... I kept waiting to hear him crying, praying with all my heart for some miracle. He was beautiful. So much like his brothers. I will never forget his smell... clean and fresh. He was starting to get cold and I was trying to keep him warm. My husband and I held him for some time... time seemed to stand still... we were in shock. My beautiful, beautiful boy. Mommy is sorry that I couldn't protect you. You had your own path and you took it. Mommy is so proud of you. You have taught your mommy and daddy so much. We miss you desperately, but I think we are now getting to a point where we feel so incredibly blessed to have known you. You have made quite an impression and I am determined to treat our experience as a positive one... for you, for us and for your precious brothers. You will be forever loved and remembered. Beading is a hobby of mine, at least it used to be. I have not been creating many pieces as of late. I have not had much interest in anything since we lost Nicholas except for making life as normal as possible for my two precious boys I have here. I am slowly getting back into it. While I am creating I am focused... and that seems to help ease the pain I feel inside. The following is a bracelet I made for myself to wear... it symbolizes the joy we feel that Nicholas touched our lives and our hearts in such a profound way. 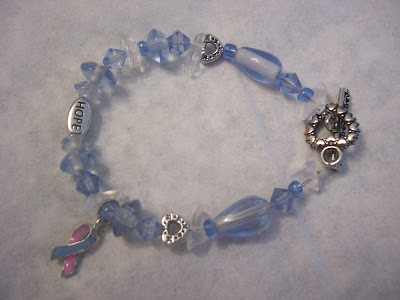 The ribbon is the symbol for infant loss.... and the "hope" is for our future. Just thought I'd share.